If you are looking for a nice Joomla responsive restaurant template, ThemeLan presents RedBowl restaurant. The template looks very pretty and it also features many great options, and it is featured at ThemeForest. RedBowl features four pre-made color styles you can choose from: brown, olive, red and blue. An impressive slide show is included, and it will make your website look very unique and attractive. This is a great place for you to display nice photos of your most delicious meals, or the nice atmosphere at your restaurant. 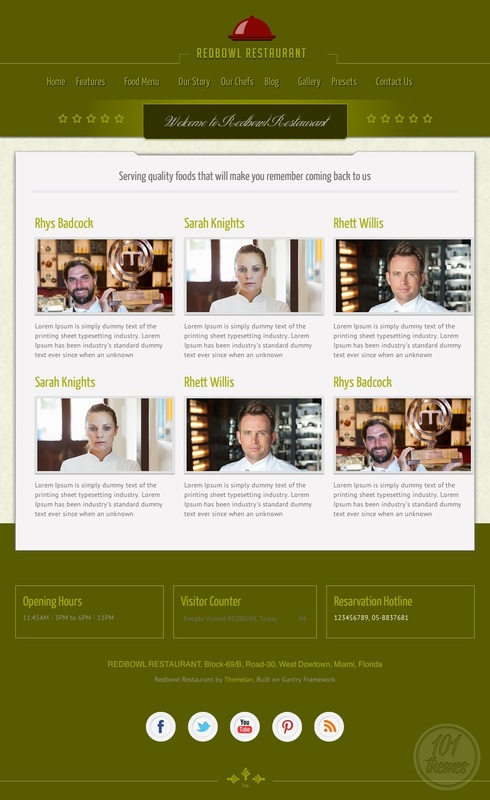 The most important thing about a restaurant template is of course the menu. RedBowl offers a completely ready menu module, with its own backend so you can easily create a wonderful looking menu with categories and a nice amount of info on each menu item. You can include photos, description and price for each dish. You will be able to properly introduce your visitors to your restaurant and your staff through posts and let them see exactly what your place represents. A nice image gallery is included so you can add many photos of your delicacies and make your visitors hungry for them as soon as they lay eyes on your amazing photos. A blog section is also included and you can post as much as you want and let your guests know all the important details you want to tell them. Nice testimonials can be displayed on the homepage for everyone to see, and you can also display your working hours and reservation info. 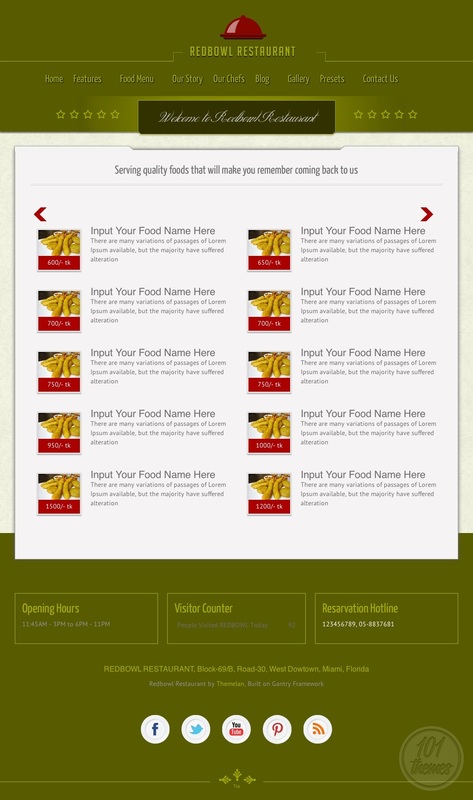 A visitor counter is included so you can have the exact number of visitors displayed on your website as well. 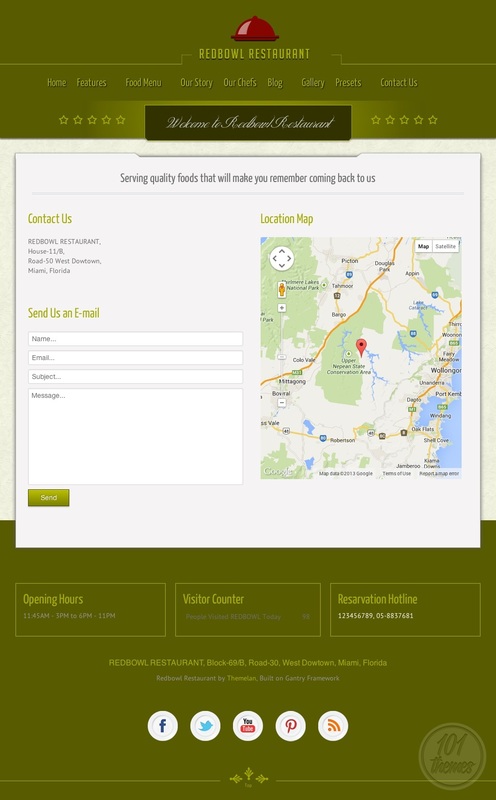 The contact page contains Google Maps integration and you will have a map with your restaurant marked on it, placed right there on your website. A nice contact form is also featured. 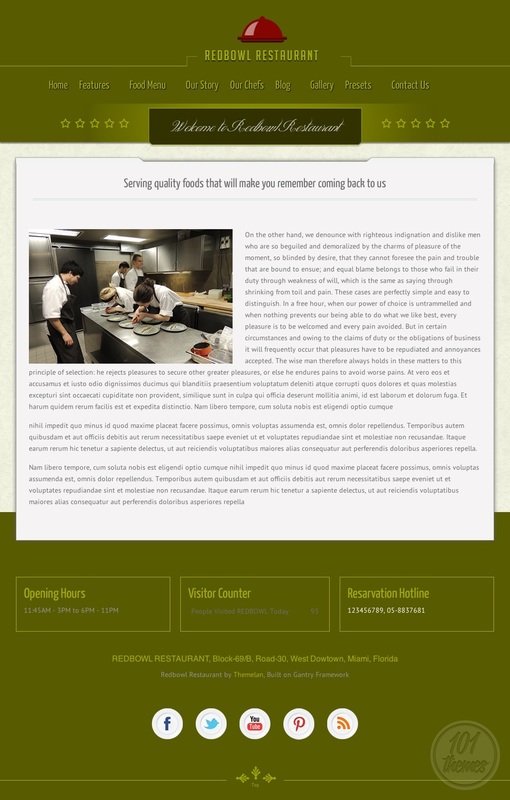 This is a responsive restaurant theme for Joomla, meaning your website is going to look great on all devices regardless of the screen size and resolution.